Bones still vibrating from the long haul uphill to Sanjegaon, I finally arrived at the vineyard overlooking the Mukne Dam Lake, only to find myself not dressed for the occasion. Beiges and whites seemed to be the colours of preference, as the cream of wine culture strutted around the expansive vineyard, hat on head, glass in hand, smile on face, pausing only to strike a pose (or a pout) for cameras that did not cease clicking. It was just another frame at The Great Grover Stomp, and I was soon going to find out what beiges and whites look like a�� after theya��ve been given the wine treatment. Our host Sumedh Singh Mandla, was about to take us on a tour of the winery, but first, we had to find him. 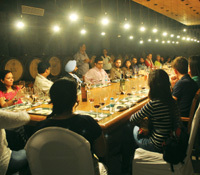 The CEO of Grover Zampa was swamped by connoisseurs, friends, celebrities and the media, some wanting to chat, others to pick his brains about their collection of wines and a few even insisting he join them for a quick session of stomping. 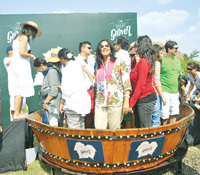 Said stomping was a continual process taking place against the backdrop of the sloping vineyard, with waves of guests taking turns to step into the shallow wooden barrel and partake in the fun. Almost everyone wanted a go at the grapes, with just a few shy onlookers not willing to admit they were scared to get their feet dirty (or their clothes stained). The tour finally began with some hands-on picking in the vineyard where they have been growing the Spanish grape, Tempranillo, successfully for three years now. Other grapes that were ripe for the picking were the Cabernet Sauvignon, Shiraz, Viognier and Sauvignon, some of which were making their way to be stomped as we spoke. But fear not, for no feet go into the making of Grover Zampaa��s wines. We were soon taken to the winery where towering fermenters stood dormant, awaiting the 40,000 cases of grapes that would soon be pressed and fed to their bellies, where a long metabolism would begin. Our heads rich with information (such as the temperatures at which fermentation takes place for different grapes), we followed Mandla to the wine cellar, where we were handed over to the able hands of Karishma Grover who was to take us through a tasting of their best wines. a�?Wea��ve just released a Merlot that is part of the Art Collection and a Viognier Reserve a�� barrel fermented, aged, and the white counterpart of the La Reserve. It will be released as the La Reserve Blanc,a�? 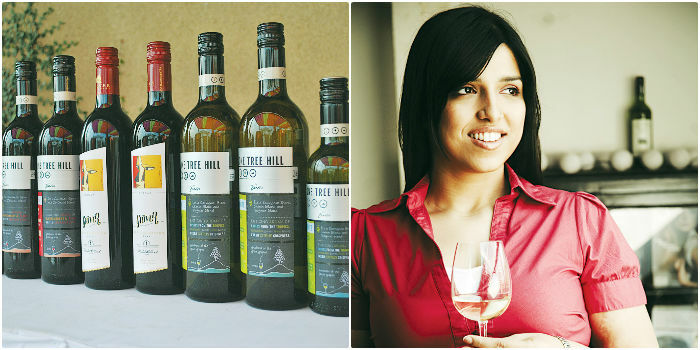 says Karishma Grover, the daughter of Kapil Grover and one of the leading winemakers in the country, about their newest wines. She also shares that plans are on for a spa hotel on the property. The cellar, dimly lit and enveloped by the smell of oak barrels, had a strangely inviting personality. And running along the centre was a table capable of seating 30, set with paper mats and glasses for the wines that were about to play tricks on our taste buds. The winemaker had our rapt attention as she described the technicalities behind four of their award winning wines a�� a gorgeously sweet-smelling 2013 Viognier, a Decanter award-winning salmon pink Rose 2013, their signature La Reserve and their newest, the Chene Grand Reserve (aged 15 months), which incidentally happens to be the companya��s most expensive too. a�?Peach!a�? a�?Apricot.a�? a�?Chocolate?a�? the enthusiastic lot of us exclaimed, as we tried to put our plebeian taste buds to the task and describe the flavour and nose of these wines. Karishma, who was suppressing guffaws by this point, also took us through a glossary of terms used when describing wine (we took note). Having teased our taste buds, it was time to head towards the buffet where a team from The Gateway Nashik had put together a menu, with some sauces even making use of select Grover Zampa wines. But for some reason my pasta in white sauce failed to impress a�� perhaps I had drunk too much, or too little. Post the hearty feasting, and free flow of red and white, one could choose to lean back in the shade of a tent and leave their feet in the hands of experts who promised a makeover. 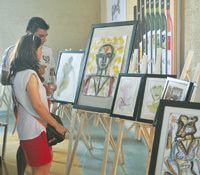 But most of us chose to head over to the Grover Charity Auction, where the very recent (a few hours ago, to be precise) works of Jatin Das and Rini Dhumal were up for grabs, alongside wine chests signed by Deepika Padukone, Nargis Fakhri and Humaa Qureshi. The proceeds of this auction, we hear, went to Jilha Parishad, a primary school in Sanjegaon. And speaking of Sanjegaon, let me close with a word of advice a�� if you plan to take home a bottle or two, make sure youa��re carrying cash, for the vineyard does not accept cards and ita��s a long way before youa��ll find an ATM!